The Nashville Predators have been on a roll of late with five wins in their last seven games with their only losses occurring in overtime. Before that, however, it was a different story as they lost six in a row, including four against non-playoff teams. The biggest reason for their turnaround has been a return to health, especially by key players as Viktor Arvidsson, Filip Forsberg and P.K. Subban all missed extended periods of time between November and January. Arvidsson has had two injury absences this season. His first occurred in early November when he missed three games with a lower-body injury. In his first game back, a Nov. 10 matchup against the Dallas Stars, he suffered a broken thumb that prevented him from playing in the next 21 games until he made his return on Dec. 27. Considering he was projected to be out until 2019, he recovered faster than expected. The team went 9-10-2 in his absence. Although he has had two injuries this season, I’m only focusing on his second injury for the purposes of this article. Forsberg went on injured reserve after he went down with an upper-body injury on Nov. 29. He was originally given a four-to-six week timeline for recovery and was back in the lineup on Jan. 7, a date within that recovery window. In the 17 games he missed, the Predators went 8-7-2. Subban missed 19 games between Nov. 13 and Dec. 27 with an upper-body injury. The team never provided an estimate for when he was expected to return, but he missed 19 games and the team had a 9-9-1 record in his absence. Realistically, he basically missed 20 games as the game he got hurt in, a Dec. 13 matchup against the San Jose Sharks, he played just over seven minutes. Losing just one of the three for a lengthy time period given each’s role on the team would have been a blow to the team’s performance. Having two top-line wingers miss time would have been difficult for most teams to overcome. But losing two-thirds of a top line and a number one defenseman is unfair. Especially when you consider how well each was playing prior to his injury. Before he went down on Nov. 10, Arvidsson had appeared in 13 games on the season. In those games, he had eight goals, all at even strength, 13 points, shot 23.5 percent and averaged 18:13 of ice time per game. He had points in nine of his 13 games, including a six-game point streak that immediately preceded his injury. He had three multi-point efforts, had at least one shot on goal in 12 games and at least an even turnover margin in nine. 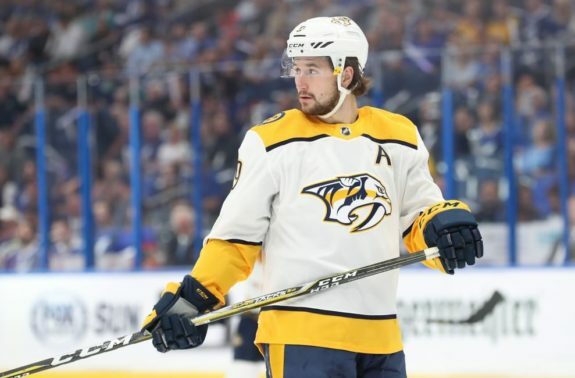 Filip Forsberg played in 26 games prior to his injury and had 14 goals and 22 points. Of his 14 goals, 10 were scored at even strength, three were on the man advantage and one was a shorthanded tally. He shot 16.3 percent and averaged 18:54 per game. He registered a point in 15 of 26 games, two or more points in five and put a shot on goal in 25. He also managed to not have a negative turnover margin in 14 games. Lastly, Subban played in 18 games before he suffered his upper-body injury and had two goals and 12 points. He shot 4.3 percent and averaged 22:43 per game. He had at least one point in nine games, multiple points in three and had seven games in which he played over 24 minutes. He had a shot on goal in 16 games and had 10 games with at least an even turnover margin. Arvidsson has appeared in nine games since returning to the lineup on Dec. 27 and the Predators have a 5-2-2 record in those games. He has six goals and one assist since rejoining the team and is shooting 15.8 percent while averaging 20:06 per game. He has attempted at least two shots in every game and an even turnover margin in six games. At five-on-five, he has averaged at least six shots-per-60 (S/60) and six individual scoring chances per-60 (iSCF/60) in each game. For the season he has 14 goals and 20 points in 22 games while shooting 19.4 percent and skating 18:59 per game. His .64 goals-per-game (G/G) and .91 points-per-game (P/G) are both career highs. Arvidsson has been dynamite since returning to health. He was immediately put back on the top line with Ryan Johansen and hasn’t missed a beat as his footspeed has been as noticeable as ever. His most memorable moment since returning was his breakaway goal against the Chicago Blackhawks on Jan. 9 in his eighth game back. Forsberg, like Arvidsson, is a top-line winger who joined his linemates in his first game back. In his three games since being taken off injured reserve, he has two points, both goals, with one occurring on the man advantage. He is shooting 14.3 percent and averaging 16:55 per game. The Predators are 2-0-1 since his return. He has attempted at least three shots on goal in each game and has at least an even turnover margin in two of the games. At five-on-five, he has averaged at least 13 S/60 and eight iSCF/60 in each game. In 2018-19, he has played in 29 games and has scored 16 goals, including four power play goals and one shorthanded tally, and 24 points. He is shooting 16 percent while playing 18:41 per game. He is averaging .55 G/G, a career high, and .83 P/G. It was easy to forget how talented Forsberg is, with and without the puck, when he was absent from the lineup. He’s got great hands, is a dynamic playmaker and possesses near-elite vision. What gets forgotten with his game is that he is tenacious on the forecheck and isn’t afraid to get physical in the offensive zone with the goal of gaining possession for his team. His best moment since returning was the overtime game-winner against the Blackhawks on Jan. 9. Like Arvidsson, Subban returned to the lineup on Dec. 27 and has played in nine games since being activated off injured reserve. In those games, he has two goals, both at even strength, and five points. He is shooting 10 percent while averaging 20:09 of ice time per game. He has put one shot on net in eight of nine games and has played over 21 minutes in four. He has also had at least an even turnover margin in six games, quite a feat for a top-pair, puck-moving defenseman. On the season, he has four goals, including two at even strength and one each on the power play and while shorthanded, and 17 points in 27 games. He has shot 6.1 percent and is averaging 21:51 of time on ice per game. He is experiencing scoring rates of .15 G/G and .63 P/G, both in line with career averages. Upon his return, he initially looked slow as if he was struggling to skate. This got him out of position and forced him to rely too much on physicality instead of positioning when defending. His most notable moment since returning was his goal from the point against the Toronto Maple Leafs on Jan. 7 to put the Predators up 2-0. Something that is interesting is that, since he has returned, he has gone between playing on a pair with Mattias Ekholm, his normal partner, and Matt Irwin, typically a third-pair defenseman. I don’t think it has anything to do with the play of Subban or Ekholm, but that the switch happens so that the third pair of Dan Hamhuis and Irwin doesn’t get caved in. It will be interesting to see what happens moving forward. 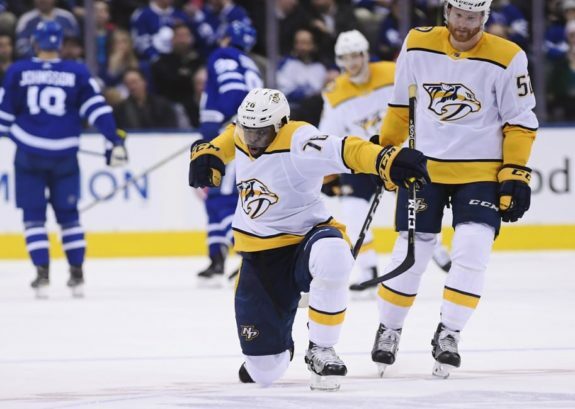 Given the talent of Arvidsson, Forsberg and Subban, all three play key roles for the Predators. These roles go beyond being asked to provide offense and create scoring chances on a nightly basis. All three play in every situation – even strength, penalty kill and power play. That means each has a major impact on the team’s performance, both for the season and since returning to the lineup. For example, Arvidsson has played at least two minutes on the power play in eight of nine games and has received time on the penalty kill in seven games. Forsberg has had at least two minutes of power-play time in two of his three games but no shorthanded time and Subban has played at least one minute on the man advantage in eight of nine games and more than a minute on the penalty kill twice. At five-on-five, each is having a positive impact on the team as well. 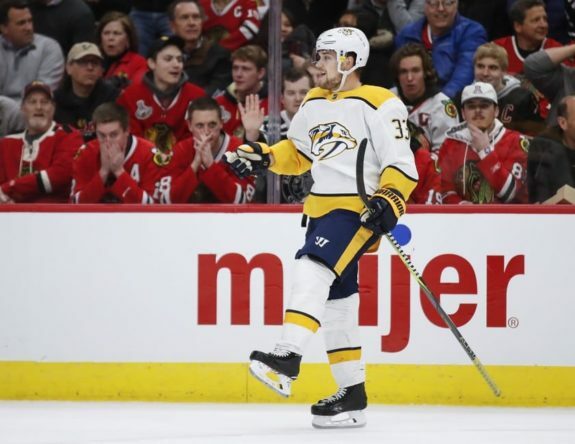 With Arvidsson on the ice, the Predators have controlled at least 50 percent of shots in six of nine games and over 60 percent in the last three games. The same holds true for control of scoring chances. They’ve also controlled at least 50 percent of high-danger chances in five games and have had a PDO above 1.00 in three games. PDO is shooting percentage plus save percentage, with 1.00 being average. With Forsberg deployed, the Predators have controlled at least 65 percent of shots in all three and at least 66 percent of scoring chances and high-danger chances in all three. They had a PDO of at least 1.00 in one game. For Subban, who’s typically given the most-difficult zone starts of Predators defensemen, the team hasn’t done quite as well with him deployed. They controlled at least 50 percent of shots and scoring chances in three games and at least 50 percent of high-danger chances in five games. They’ve had a PDO of at least 1.00 in six games. The biggest reason for that is Predators goalies have had perfect five-on-five save percentages in four games when he’s on the ice. Of course Subban isn’t the only reason for a lofty save percentage, but he is a contributing factor as defensemen are tasked with shutting down the opposition. Given that Arvidsson, Forsberg and Subban are three of the Predators’ best players, it’s not surprising the impact their absences and subsequent returns to the lineup have had on the roster. Arvidsson and Forsberg, both top-line wingers, are driving forces of the team’s offense. The Predators were able to briefly overcome their absences as their offense is predicated upon depth, but it didn’t last the entire time. The same holds true for Subban. He and Ekholm are typically given the toughest zone starts and play against the opponents’ most talented lines with a high level of success. He plays in all situations and generates a lot of production from the blue line. With a team that relies as heavily on the defense as the Predators do, it’s no wonder the team faltered in Subban’s absence and have played better since he’s returned to health. Moving forward, as long as these three and no other key players go down for extended time periods, the Predators should continue winning and be a tough out in the postseason. 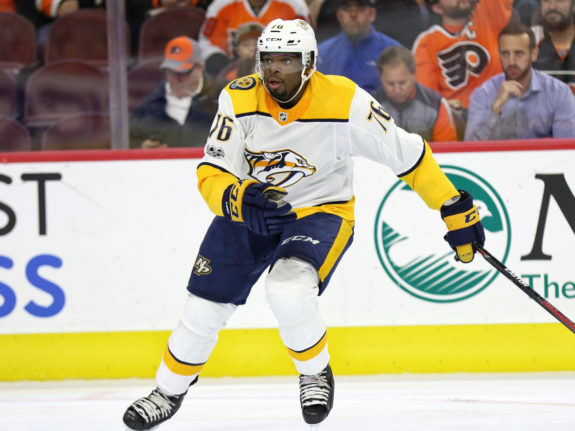 The post Arvidsson, Forsberg and Subban Dazzling in Returns appeared first on The Hockey Writers. April 5, 2018 at 7:50 PM Predators Power Play Woes a Playoff Problem?